Paintings : Sergey Kolesov is a concept artist from Lyon, France who is currently working for Arkane studios. 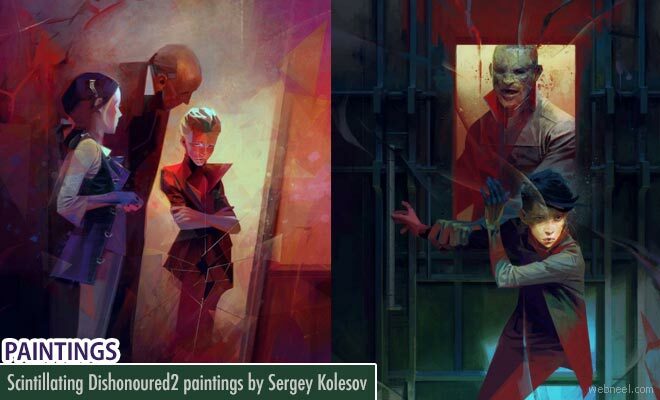 Dishonored 2, the action-adventure stealth video game developed by Arkane Studios is brought to life with paintings of Sergey Kolesov. The strokes and shapes are absolutely gorgeous and every plane is a joy to the eye of the viewer. The narrative styles and combination of colours used in paintings just make them magnificent piece of artwork. The gesticulations used in the paintings are so realistic and it brings life to the game. Delilah's motives are paintings based on her childhood memories which drives the viewer into an surreal dream world.